Are you looking to get better and improve your gymnastics skills? Sometimes it can be frustrating to track your progress, because it happens slowly over time. I know most gymnasts track their progress learning skills. But what about all the other types of progress that matter? 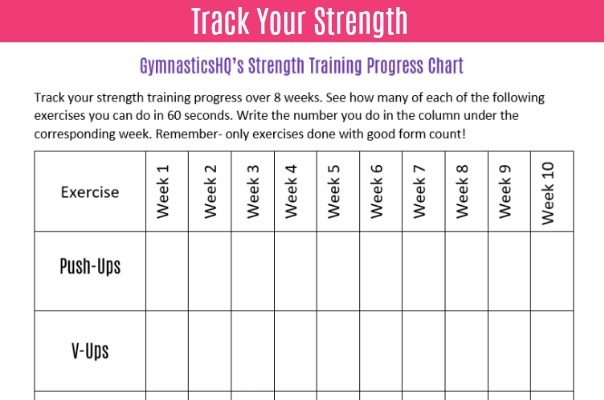 Do you track your progress getting stronger ? Do you track your improvements on the basics? One of the key components of improving in gymnastics is your strength. Getting stronger and more physically fit makes learning new skills easier. It also helps you improve the height or dynamics of the current skills you know. Improving your strength is also one of the key ways to improve your gymnastics at home. One way to track whether you are getting stronger is to see if you can do more repetitions of an exercise. You want to make sure though that you are doing the exercises with good form. If you do them with sloppy form, you won’t be working your muscles correctly. But you can track any strength exercises you choose. In the building method for learning new gymnastics skills, the first step is making sure you have the strength to learn new skills. You can use this chart and fill in the strength exercises for the muscles you will need to learn the skills you want. 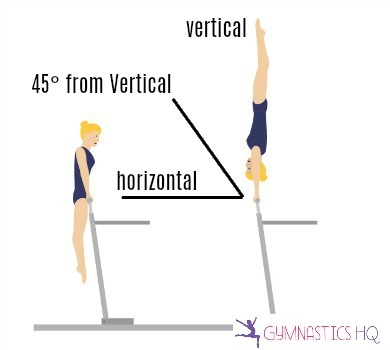 You will notice if you look at the level requirements, that as you advance as a gymnast, you are expected to be able to do certain basic gymnastics skills with a higher degree of difficulty. As an example, at level 1 one of the requirements is a split leap with a 30° leg separation. Once you get to level 6 you are required to do split leaps with 180° of leg separation. Some of the gymnastics basics that have increasing requirements as you advance through the levels are a split leap on floor, split jump on floor, split leap on beam, split jump on beam and a cast handstand on bars. 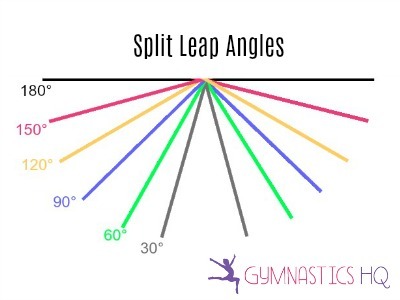 These are the minimum required separation angles for split leaps and split jumps. Remember that your leg separation should be even (your left leg and your right leg should go up the same amount) or you will get deductions. In addition to these basics, it’s important to have mastered a handstand since you use the handstand position on all of the events. For that reason I included it on the track your basics chart. The third way to track your progress is to track your gymnastics skills. Obviously learning new gymnastics skills is an indicator of your improvement in gymnastics. Also learning new skills is what enables you to move up to the next gymnastics level. 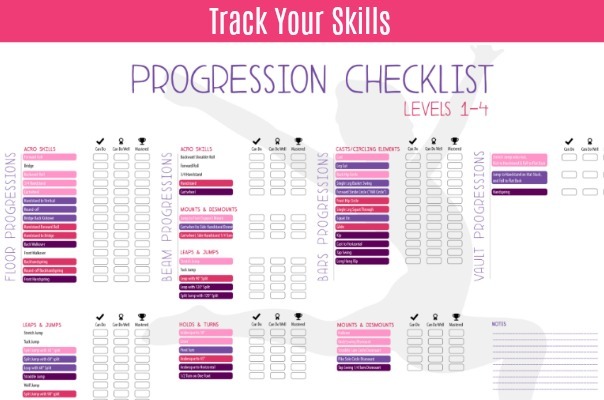 You can track your skills using my skill progression checklists. Using the checklists you can track your progress from when you’ve learned how to do a skill until you’ve mastered it. It’s important to know what skills you need at each level in your routine, so that you don’t get deductions for not meeting the requirements. Strength– You need to be strong enough to learn a new skill. Shapes– You need to learn the different shapes, or body positions you will be going through during the skill. Progressions– You need to master the progressive skills leading up to the skill you want to learn. Drills– The next step is to practice and master the drills that teach you different parts and shape changes of the skill. Spot– Then learn the skill with a spot, and let your coach help guide you through the skill until they are confident you can do it by yourself. Can Do– This is when you can do the step by yourself, but you still have some refining to do. Can Do Well– At this step you can do the skill at least 3 times in a row with good form. Mastered– You can do the skill 10 times in a row with perfect form! 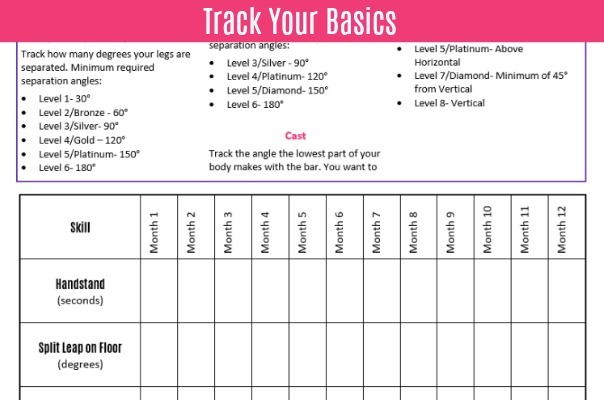 Tracking your progress will help you see where you are in the process, so that you can feel good about improving and getting better at gymnastics! I want to receive the email updates. How do I sign into skill tracker?